I learned how to make pasta from scratch just about a year ago. Ever since then, I’ve been obsessed with trying to get the perfect ravioli. My biggest challenge was getting the perfect shape, with the beautiful looking pillow top of filling, the perfect scalloped edges and consistently sized, every single time. I started out going kind of free style like I learned in the class I took at The Chopping Block. (If you haven’t been there, consider checking them out the next time you need something for the kitchen or want to take a cooking class. They know their stuff and I’d rather give them my money than some big box culinary store. Although some of those stores have a place in my heart, too. I digress.) Some of my earlier ravioli turned out flat, too big or too small to fit the amount of filling and some just fell apart once they hit the water. I even tried this tool, which only sent me on a profanity-laden rage when the pasta got stuck to the mold and screwed everything up. The taste was always pretty good, but the final product and presentation was missing what I was aiming for. Today, I decided to try that mold again. This time, I decided I’d coat it with flour first. I’d show that ravioli maker who was boss. So I went about rolling the dough, filling it with my goat cheese filling, and when I turned it over – YES! 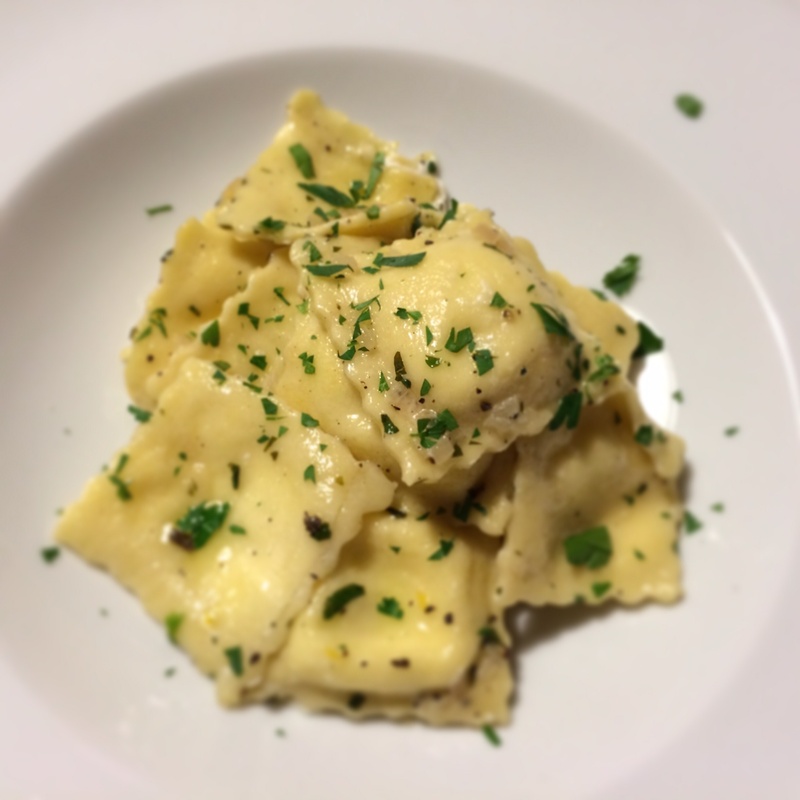 It fell right out all in a perfect, beautiful sheet of lovely, pillow-topped ravioli. Unfortunately, that’s where the near visual perfection ends. 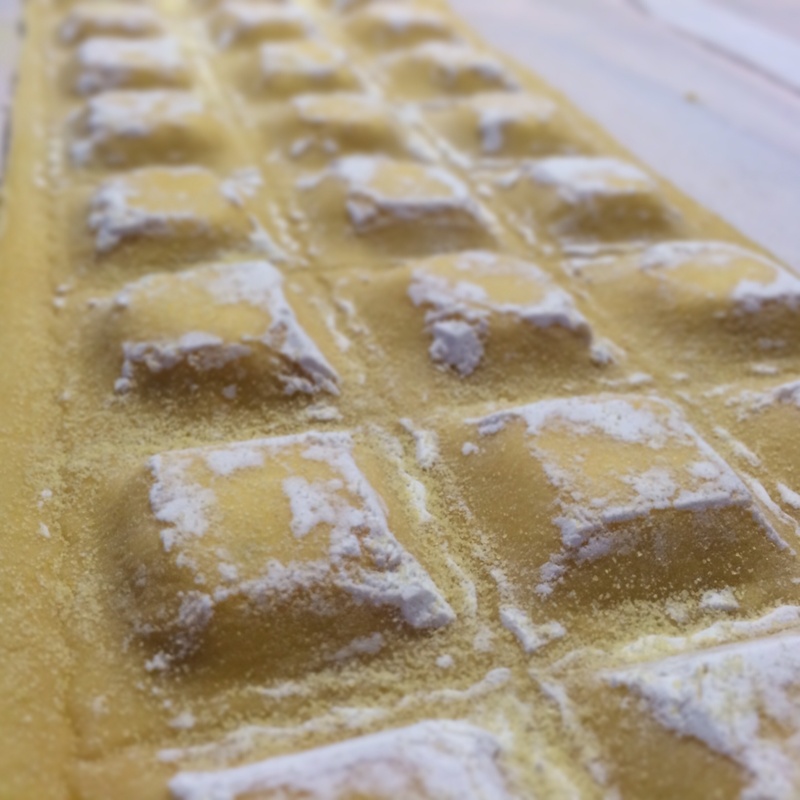 It’s apparent that I have much to learn in the art of ravioli making. Although my uncooked ravioli looked awesome, once cooked, some fell apart. Almost all had been deflated. I think what did them in was too much air inside with the filling and a weak sealing. Bummers. To be fair, this is only my 4th time making ravioli. However – the butter sauce was AWESOME. Shallots are my new best friend. Next time you’re making a sauce or dressing that calls for garlic, consider using a shallot instead. The flavor is just amazing. Mix all ingredients together either by forming a well in the center of the flour and folding in the eggs, or by putting everything into a food processor and use the dough attachment and mix on low until a ball of dough forms. Knead the dough, then seal in plastic wrap and store in the fridge until ready to use. Let the dough rest for at least 30 minutes if you can. Longer is better and the dough can stay in the fridge for up to 2 days. I usually let the pasta sit out for about 20 minutes before I begin to roll it out. Mix the cheeses together in a bowl, add the pepper to taste. Store in the fridge until 20 minutes before you’re ready to use. Letting it warm up before using will make it easier to work with when filling the pasta. Cook the pasta in salted water for 3-5 minutes. Just as you drop the pasta, melt the butter and add the shallots. Once the shallots become aromatic, add the wine and reduce by half. Add the herbs and cook for another 2 minutes. Add the ravioli to the pan and cook together for another 1-2 minutes. 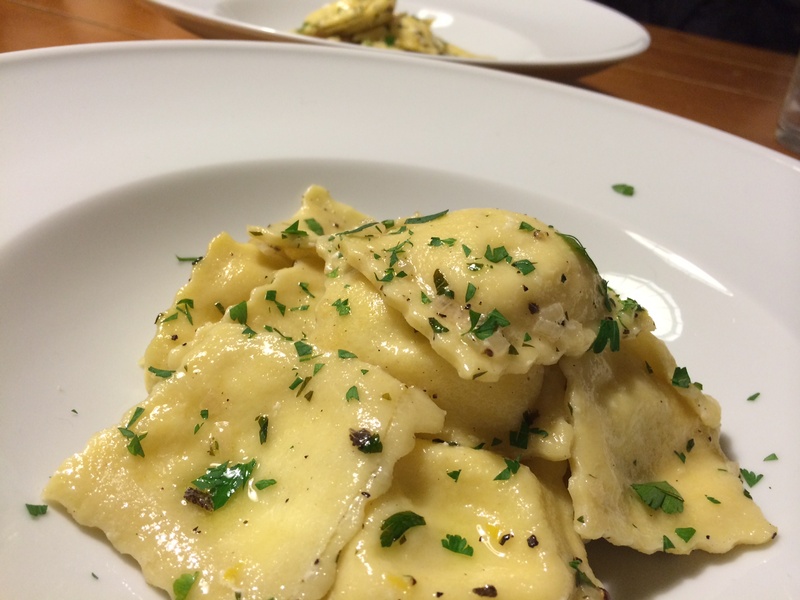 Serve the ravioli with the sauce, and garnish with extra parsley.